A visit to the Stereo Pairs Collection today and to a country church(?) with "square tower of rubble masonry". The shot has been reduced to a single image for ease of viewing on Flickr. In the past we have been able to identify places and times by the tombstones but I am not sure the detail is there on this one. Because of the different family names, is this a grave of disaster victims. A quick peruse of the irishgenealogy.ie website suggests that a Corn(elius) Ryan and a Mary Lucey both died in Macroom in 1865 and 1866 respectively. Deaths for 4 people called Denis Manly are also recorded between 1865 and 1887, all in Cork City or county. I think there may be a Cork connection in this photograph. Strictly speaking, the definition of a hamlet is a small settlement which does NOT have a church. Possible clue for consideration. As www.flickr.com/photos/beachcomberaustralia/ offered- catalogue.nli.ie/Record/vtls000563899/Details#tabnav Notice the Stereo-Pairs have a number in the top-centre "581". What photos do NLI have that have "549", "580", "582", "583", for example. What was the method of travel during the period the photo was taken, with photographic equipment? Horse and buggy? Walking? Horse, only? Next, if you have identified photos "580" and "582" and you make an assumption about speed, amount time to travel, then you could deduce a distance and then make concentric/intersecting rings on a map to determine probable locations of the church for stereo-photo "581". STP_580 is in Cork. STP_583 is in Cork. Findagrave shows lots of Mary Luceys, mainly in Cork. www.flickr.com/photos/[email protected]/ Anything more illuminating to offer? Why always the same comment, "Congratulation for your beautiful Album."? Spam! The building looks to be at least two different ages. The oldest bit is the rubble masonry tower with limestone hexagonal spire. The nave looks newer, cut stone with arched windows. www.flickr.com/photos/gnmcauley/ www.flickr.com/photos/bultacofan/ This is a tough challenge Googled "churches in Cork and Macroom" "church steeples made of rubble in Ireland" "James Simonton" "Frederick Holland Mares" And, other Looked at all Google images available No luck. www.flickr.com/photos/nlireland/28737476745/ same Photographers, as in the photo above And, it seems to be an odd-looking church steeple. Anglican, Uniting, Presby, and maybe a currently de-certified church, might be in private ownership. Are there any, Irish heritage building sites? www.flickr.com/photos/[email protected]/ A long shot but could it be Old St Senan's Church, Inniscarra www.geograph.ie/photo/989462 None of the structures look the same. The front of the church is different, no side structures, steeple is constructed differently, none of the graves in the above photo have crucifix-type headstones. Each of these are visual cues. Manly and Lucey in Cork are all RC by 1901. I'm not convinced it's COI, especially with those windows. I think the third name may be Honora Kenny rather than Honoria Kemmy as noted above. According to the census, the only place you get both Manlys and Kemmys is Limerick. [https://www.flickr.com/photos/[email protected]] That's it, alright. Well done! Well done sissonni - certainly looks like it. 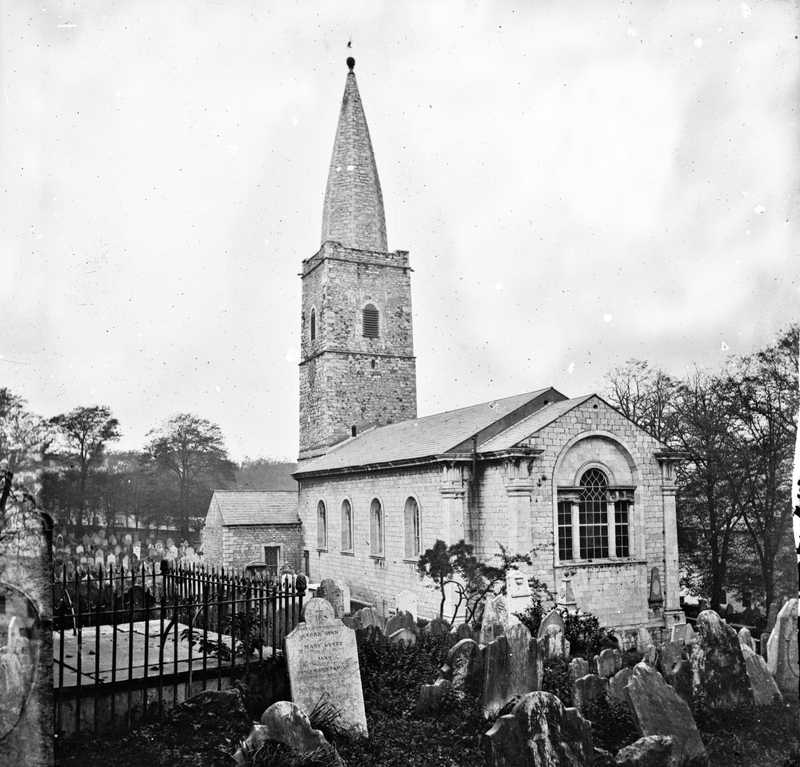 Here's another photo : archiseek.com/2015/1738-st-finn-barres-cathedral-cork/ Not exactly a "country churchyard" so. I wonder are the graves still intact. As usual I miss the Cork ones. Sounds like it's all wrapped up. But this is definitely the original St Finbarres. Looking towards Bishop Street. The reverse view is unequivocal. Well done [https://www.flickr.com/photos/[email protected]]. As per the recently improved/featured article on Wikipedia, this building was demolished in 1865. To make way for Burges' new construction. 1865 is therefore the latest possible date for this image. Making it one of the oldest/earliest shots we've seen in a while. [https://www.flickr.com/photos/[email protected]] Well done! Makes it one of our earliest dated images.